How worry-free furnace and central air conditioner rentals are helping Calgary homeowners heating and cool their homes easily and affordably. Combatting the cold winters in Calgary does not have to be an uphill battle and you don’t have to go it alone. The city of Calgary with its high elevation and prairie climate makes for frigid temperatures during the winter months. Whether in early fall or in the dead of winter, our high quality and reliable furnaces are just the thing to keep you and your family warm and healthy no matter what. Not only do our furnaces come from the best companies and bear the brand names that you know and trust, but our rental program comes with 100% worry-free coverage on all parts and labour, so you never have to pay for repairs! Faster than when the Chinook winds start blowing into Calgary you can count on us to not only install a high-efficiency furnace in no time but you can also call on us any time to keep it running in peak condition. If you find yourself in need of a better furnace or simply want to explore the options that are available to you right now in terms of an HVAC system you owe it to yourself to keep reading. If you have never considered renting your furnace as opposed to buying a new one outright let us fill you in on all the great benefits. 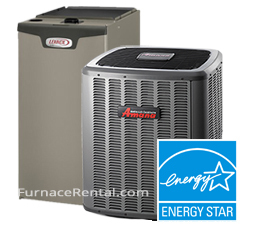 For starters, there is no high upfront cost when you rent your furnace with us. Many homeowners would find shelling out thousands of dollars for a new high-efficiency natural gas furnace a tricky proposition. But you obviously need a reliable furnace before the winter comes in Calgary we are your best option because you will not have to pay a dime for us to install one in your home. We come in, handle the installation, handle the removal of your own unit and you don’t pay a thing until your first monthly bill, one affordable and predictable price for efficient and effective heating. With our flexible credit approval, as long as you’re the homeowner, you’ll be approved in most cases. Or if you rent your home, simply get the owner’s approval. We find landlords love the fact that we take care of all maintenance and repairs… one less thing for them to worry about! The simplicity of our rental program is what spurs our customers to tell their friends and family about us. We know that most people are in the dark as far as what kind of furnace or AC they will need for their home and that is precisely why we are staffed with the most knowledgeable and helpful experts we could find. All you have to do is tell us what kind of system (heating or cooling) you need and we will informatively guide you through the steps of choosing the perfect furnace or central air conditioner to rent. We match effective heating and cooling solutions with your needs and budget. We understand your concerns as a resident of Calgary. Temperatures can easily drop as low as -30 degrees Celsius in the winter. You need a furnace you can depend on and you need to know that you have the full support of a certified team of technicians that are always on call. Free Annual Checkups – We care about your comfort and know that just because everything seems to be working fine with your unit does not mean that your furnace cannot work better. We offer free scheduled checkups every year apart from any service you may need to call us for. Rent to Own – There are no contracts with us. You can rent your unit for as long as you need and buy it out from us at any time. Next Day Installation Available – A breakdown can happen at any time which is why we do our best to have your rental unit installed as soon as possible. In many cases we can install your new furnace the day after you contact us. If you are not sold on the idea of renting a furnace consider the following: one of our high-efficiency furnaces can save you hundreds of dollars a year. Not only are our ENERGY STAR certified HVAC appliances good for the environment but they can save you money in the long-term as well.